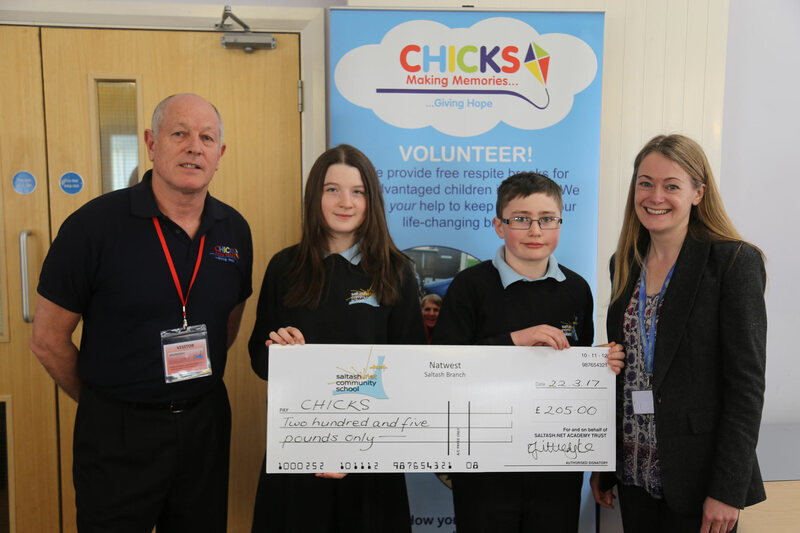 Saltash.net was delighted to present CHICKS with a cheque worth £205 last week, following fundraising efforts from our Sixth Form. CHICKS organise holidays for children from disadvantaged backgrounds, those in care and young carers, to give them respite and a holiday that they wouldn’t otherwise have. The charity has helped many young people in Cornwall, and has provided free respite breaks to many disadvantaged children from Saltash, Liskeard and nearby areas in the past. CHICKS presented to our Sixth Form last year, discussing volunteering opportunities, and encouraging the school to help with fundraising. They then liaised with saltash.net Head Students Rosie Thompson and Bronwen Hall to organise a non-uniform day, which took place on Friday 10th February 2017. Thanks to all who donated to such a fantastic cause.